Galvanising Australians into action around ARF is one aim of this documentary and educational package. It was great working with some of the young Aboriginal people and their families who feature on the film. They make great ‘stars’ and capturing parts of their stories on film provided such insight. And I loved filming with Mike Hill. When the film locations are remote and there is no guarantee that something important won’t come up and interrupt the planned film sessions, you need a certain type of personality; a ‘can do’ one. That’s Mike. Filming often involved a large number of variables. Could I find the right people to ask if it was suitable to film at a certain time? Would the tropical storms hold out? Would something unforeseeable, like a funeral, prevent participants from filming on the day? Did we have the right permissions to be on certain Aboriginal lands? But it worked out despite large distances travelled and multiple variables. And some amazing footage eventuated that no-one could have planned for. For example, an impromptu outdoors Christmas dinner, or a home-grown version of basketball? The documentary captures the plight of young Aboriginal people with ARF. It also captures a very similar story in New Zealand. The actions to remedy this plight are multi-pronged. But we need to start with creating awareness among all people in our nations. This is a serious but preventable issue. Alice Mitchell is the Indigenous Liaison for Take Heart. Alice has lived and worked in the Top End for over 20 years, including in communities, and is fluent in the Djambarrpuyngu language. She recently undertook a PhD on Rheumatic Heart Disease, an area of great interest to her as a result of working as a remote area nurse with young Aboriginal people with this preventable condition. 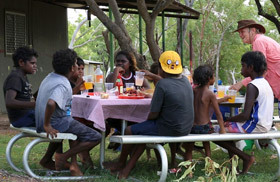 “It was devastating to watch young people who you’ve known since they were small have their lives end at age 20 with Rheumatic Heart Disease!” And conversely, when working on health DVD and Radio productions, a joy to see that, when the time is taken, and we work together, that Aboriginal people can get the information they need in order to get control conditions that play havoc with their lives.